Movies, TV shows and history itself have given the nickname of Sin City to the emblematic city of Las Vegas, located in the south of the state of Nevada. It is also known as the capital of global entertainment because of the infinite options of leisure that Las Vegas provides 24 hours a day throughout the year, suitable for all audiences. Las Vegas presents an arid climate, with very little rain and quite hot summers. Its temperatures above 82ºF (28°C) from May to September make it a suitable city to visit all year round. Regarding the means of transport, Las Vegas has several options such as buses, taxi lines, and the monorail to travel long distances. Las Vegas has excellent connections to other cities and international flights through the McCarran International Airport, located to the south of the city. When it comes to the gastronomic department, the word “multicultural” is what defines Las Vegas, fast food restaurants are the order of the day, from buffet-style to the most traditional ones. Those who visit Las Vegas for family weekends, business trips, romantic getaways or adventures, have multiple options for accommodation in the city, near the main attractions, and at affordable prices. As for the best areas to stay in Las Vegas, The Strip stands out for being the entertainment center of the city, having good transport connections and offering a wide variety of hotels. (See accommodation in The Strip). Here’s a guide with the best areas to stay in Las Vegas, Nevada. The Strip is one of the most photographed avenues in the United States, and is a part of Las Vegas Boulevard South. The Strip is among the best areas to stay in Las Vegas because of its cultural, historical, recreational and scenic value. It is important to know that the airport is close to The Strip, so this area is recommended for business travelers, tourists who make a quick visit, or for a layover. The Strip connects with other districts of Las Vegas through several bus lines, as well as the monorail, available on the east side of the avenue. Shopping is considered a favorite activity among those who visit Las Vegas. Bonanza Gift Store, Miracle Mile and Forums Shops, at the Caesar Palace, are almost mandatory stops for shopping located on The Strip. The Strip is recommended when staying in Las Vegas for being the main entertainment center in the city and hosting several hotels and resorts, from affordable prices to the most luxurious ones. The MGM Las Vegas Park is located on the Las Vegas Strip, next to the 20,000-seat multipurpose arena T-Mobile Arena, and houses a casino and the Park Theater, a 5,200-seat theater featuring the best musical artists in the world. This resort located on the Las Vegas Strip features a Caribbean-style “GO Pool” pool with entertainment for over 21s. The complex also offers a Beach Club Pool ideal for families, plus 1 spa and 2 casinos. This 5-star resort on the Las Vegas Strip features spacious suites, more than 80 international restaurants, a state-of-the-art casino and a nearly half-hectare terrace. The complex houses the Grand Canal Shoppes shopping center. East of The Strip does not escape the hustle and bustle of the city. 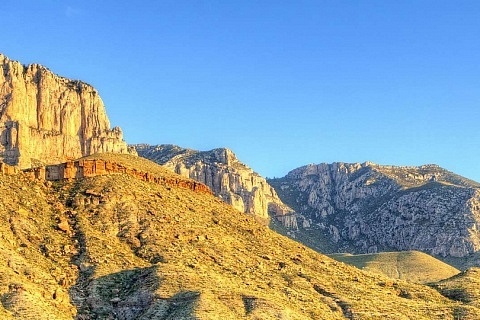 In this lively area, there are other attractions worthy of a visit when staying in Sin City. Some of the famous places in East of The Strip are the National Atomic Testing Museum, Madame Tussauds and the High Roller. East of The Strip is a well-connected area, thanks to the monorail and several bus lines along S Las Vegas Blvd. 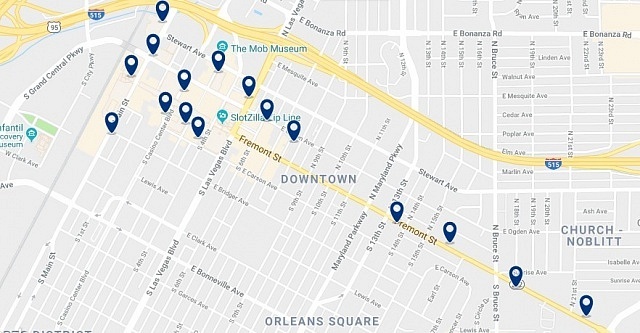 Unlike The Strip, renting a car in East of The Strip is a viable option because of parking availability. For shopping lovers, this district is home to trendy stores where there are recognizable brands such as Versace, Tiffany & Co, and many more. The University of Las Vegas is also located in East of The Strip, as well as bars and nightclubs that are frequented by a cheerful student community. We recommend East of The Strip as one of the best areas to stay in Las Vegas for its hotel offer, with great prices compared to other areas of the city. This property is located near McCarran International Airport, just minutes from the famous Las Vegas Strip, and offers 1 and 2 bedroom suites with all the comforts of home, including a fully equipped kitchen. This hotel is one mile from the Las Vegas Strip and offers a free shuttle service to McCarran International Airport. It also has an outdoor pool. The Hard Rock Hotel features décor inspired by the lifestyle of rock stars and an outdoor pool, where parties with performances by world-famous artists are organized. 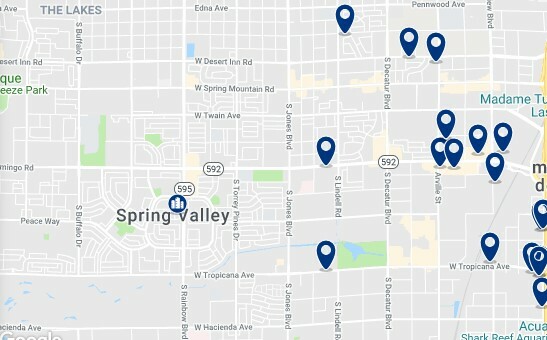 West of The Strip is a historic neighborhood northeast of the Las Vegas Strip, an area bounded by Carey Avenue, Bonanza Road and Rancho Drive that connects downtown Las Vegas. It is considered the historic black neighborhood of the city because of the entertainment centers of this area, frequented by the African-American community of Las Vegas. The West of The Strip receives its visitors with the famous sign “Welcome to fabulous Las Vegas“, and offers a cheerful atmosphere that makes it an ideal tourist destination to visit during a short stay in the city. To travel from West of The Strip to other districts of the city, you can take the bus at the stops of Tropicana Ave. and Russell Rd. The activities to do during your stay in West of The Strip vary from going to the Shark Reef Aquarium, or enjoying the nightlife in bars and Casinos. The West of The Strip is a recommended option when choosing the best areas to stay in Las Vegas for its wide variety of tourist attractions. This luxury resort has a spa and various casinos, restaurants and nightclubs. The Las Vegas Strip and the Eiffel Tower restaurant are 3 blocks away. The modern rooms at Las Vegas Palms Place Hotel and Spa have floor-to-ceiling windows, a kitchenette and a marble bathroom. This hotel is located just one mile from the MGM Grand Las Vegas and Mandalay Bay casinos. It has an outdoor pool and offers rooms with cable TV. This all-suite hotel and casino offers a full-service spa and beauty salon and outdoor pool open seasonally. This hotel has spacious suites with a refrigerator and a safe. They include a separate dressing area and panoramic views. Fremont Street was built in an effort to attract tourists to Downtown Las Vegas. This area of the city is made up of casinos of all kinds, connected to each other by the monorail or underground passages. Although Downtown is the business district in Las Vegas, this area also hosts shows, art exhibitions, galleries and museums, visited by hundreds of people a year. Busy bars and nightclubs in the city center encompass much of the nightlife, giving value to the phrase “what happens in Las Vegas, stays in Las Vegas”. 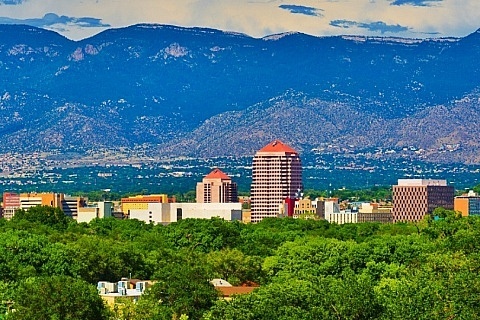 The Downtown is also home to the famous wedding chapels with a judge dressed as Elvis, bachelor parties and an impressive amusement park in Stratosphere. 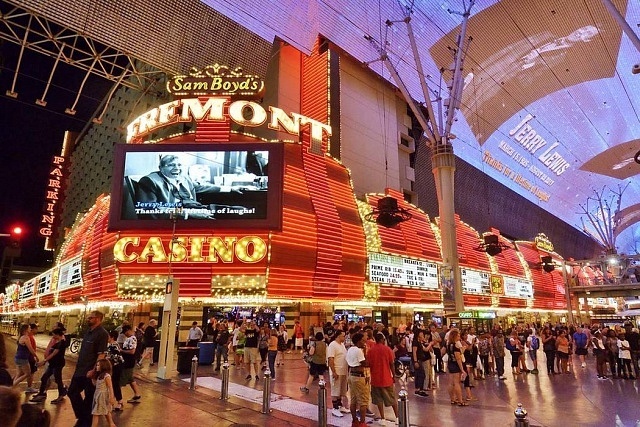 Downtown is recommended as one of the best areas to stay in Las Vegas, especially Fremont Street for its hotels with prices adaptable to any pocket, entertainment and attractions to see during your stay. This hotel is located in Las Vegas, on the east end of the popular Fremont Street Experience pedestrian mall, and houses a casino. This establishment also has a bar ideal to relax with a drink. Oasis at Gold Spike is located in downtown Las Vegas, just 3 minutes’ walk from the Fremont Street Experience. This hotel offers an outdoor pool and rooms with free Wi-Fi and a unique design. This Las Vegas casino and resort is less than 5 minutes from the Fremont Street Experience and features an outdoor pool, poolside bar and lounge area. It offers elegant rooms with a soft bathrobe. Although, technically, Henderson is an independent city, it is part of the metropolitan area of Las Vegas and is located in the Clark County. 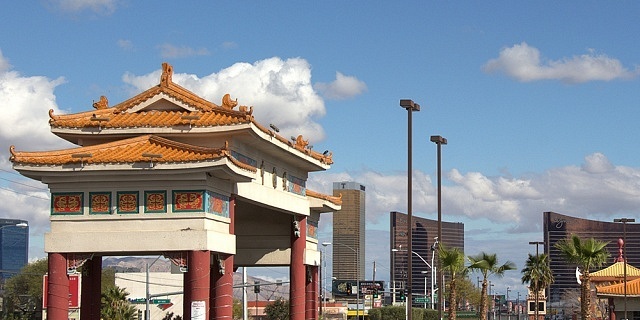 Henderson offers a interesting contrast between residential and touristic environment, with important shopping centers, concert halls, restaurants, and casinos. 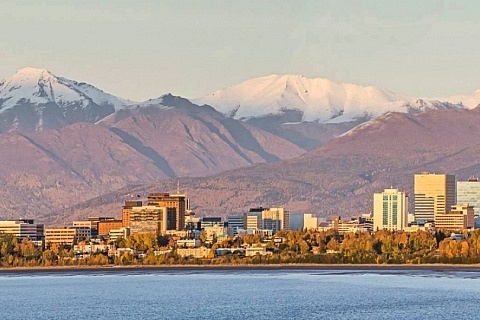 Henderson is a very visited area, thanks, in large part, to the variety of accommodation options it offers. The landscape of Henderson is formed by deserts and mountains, in addition to the striking black rocks that are the product of a volcanic explosion from millions of years ago. Henderson connects to the rest of Las Vegas through a bus network. The Skyline Hotel and Casino is located in Las Vegas, 9.3 miles from the Las Vegas Convention Center and 10 miles from the Mandalay Bay Convention Center. The property is about 10 miles from the Crystals shopping center. This hotel and casino is located in Henderson, Nevada, and features a movie theater and several dining options. The hotel offers an outdoor pool and hot tub. McCarran International Airport is 10 miles from the hotel. This boutique resort is 17 miles from the Las Vegas Strip and features a Mediterranean-inspired architectural style. It has an outdoor pool, restaurants, shops and rooms with free Wi-Fi.